So, apparently I almost missed the boat! 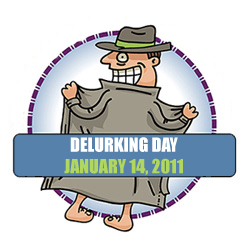 Today is National Delurking Day! Don't ask my why it's today or who actually made this up... but I think it's a great idea! I know some of you who read my blog and never comment *coughNotNamingNamescough*, but I also know that I get hits from 800 different locations around the world and over 1500 actual hits a month. Who are you people and where are you from??? Enquiring minds want to know! So please leave a comment, even anonymously if you wish, and at least tell me where you're from and perhaps why you like reading here! And if you do leave your blogger profile I can then come visit you! I'm in Iran and read your blog for make my English better. I looked for a good blog two days ago and found yours at first. Our blog is in persian language but I give you our address as you sayed. Please forgive me if I wrote English bad. Yes, I'm always curious who is lurking around my place as well. Went to college with you and somehow on facebook or something I found your site. Now I check it everyday.